52a. [Put your tongue on a ticking device’s inner machinery?] LICK CLOCKWORK (LIKE CLOCKWORK). Ouch. 124a. [Ballerina performing for architect Maya?] LIN DANCER (LINE DANCER). The only extra I in the theme entries is found in JULIA. Since it makes a long E sound or a consonant Y sound depending on whether an English speaker pronounces it as three syllables or two, and not a short or long I sound, it does not bother me. 43a. [Laser and Taser, e.g] ACRONYMS. I knew at one point that laser was an acronym of Light Amplification by Stimulated Emission of Radiation. Taser, on the other hand, is short for Thomas A. Swift’s Electric Rifle, named by one of its creators after the book Tom Swift and His Electric Rifle. The inventor, Jack Cover, added the A to make the acronym easier to say. 121d. [Creature that resembles a lamprey] EEL. Lampreys are more closely related to sharks, with their cartilaginous “skeletons.” The above image and more comparisons between the two slimy aquatic things are found here. 114a. [“Chess” piece?] SCENE. Chess is what happens when Tim Rice and half of ABBA get together to create a musical. According to a June 2017 interview, Rice is working on a Broadway revival for late 2018. Also, now I have “One Night in Bangkok” stuck in my head. Thanks, Evan. 86a. [Method of viewing black-and-white beasts at the zoo from far away] PANDA CAM. Several locations have them, including Smithsonian’s National Zoo and the Gengda Panda Reserve in China’s Wolong Valley (which is under construction but has amazing video from previous live feeds). 93d. [Colorful pond denizen] KOI. There are many relaxation videos of koi ponds on YouTube, some up to 3 hours long. This one is a short interaction between some koi and Timo the Ragdoll Cat. 22a. 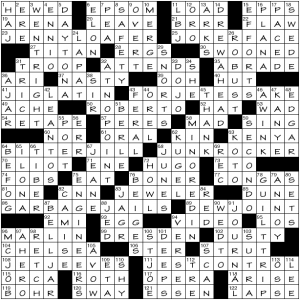 [This clue’s 110-Across, timewise], MIDNIGHT HOUR, which is 12 letters long, and midnight is 12 am. 28a. [This clue’s 110-Across, at the Olympics], DIVER’S GOAL. A perfect score of 10. 49a. [This clue’s 110-Across, as is relevant each November], VOTING AGE IN AMERICA. 18. 64a. 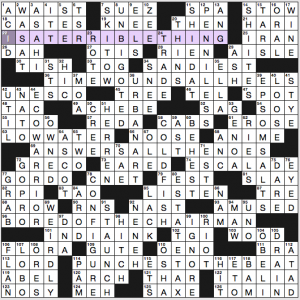 [This clue’s 110-Across, to the superstitious], BAD LUCK SYMBOL. 13. 81a. 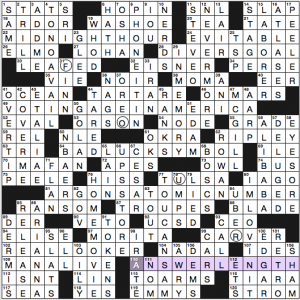 [This clue’s 110-Across, in chemistry], ARGON’S ATOMIC NUMBER. 18. 102a. [This clue’s 110-Across, in terms of attractiveness], REAL LOOKER. I feel like this phrase wants to be preceded by “a.” 10. There’s also the number spelled out by the four circled letters: FOUR. There’s a notepad that says “The circled letters spell a bonus answer related to the puzzle’s theme.” I dunno, that feels inconsistent with the rest of the theme and rather pointless. The O is in a neighborhood with NLE and TARED, so probably that chunk of fill could have been improved without the circled F-O-U-R.
24a. [Not definitely going to happen], EVITABLE. Not sure I’ve ever used this word. 46a. [End of the sci-fi film titles “First Man …” and “Last Days …”], ON MARS. 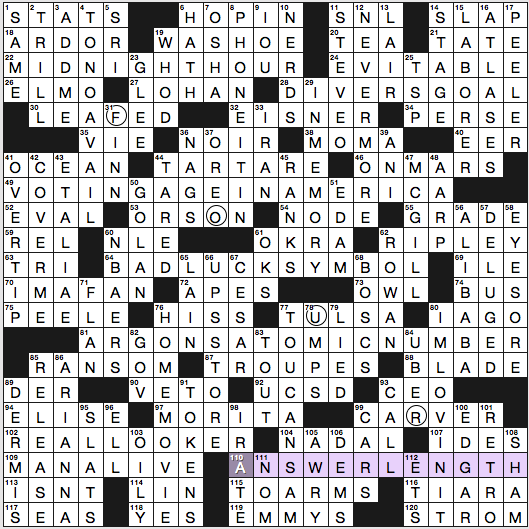 We don’t see a lot of 6-letter partials in the NYT puzzles. 99a. [Thanksgiving role], CARVER. Yes, in the traditional school play at Thanksgiving time, the smartest kid is chosen to portray George Washington Carver. 43d. [List-ending phrase], ET ALIAE. Ha. As if anybody much is spelling out that particular expansion of et al. 60d. [Shooting stars? ], NBAERS. I wondered if anyone legitimately uses this term, and found it in a Deadspin headline, so I guess it’s legit. 62d. [Mountain ash], ROWAN. Can’t help thinking this answer is a lot easier to a lot more people when clued as Rowan Atkinson or the classic Rowan & Martin’s Laugh-In. I mean, I grew up with a mountain ash tree in the back yard, and we never called it a rowan. 100d. [One of Mr. Poe’s children in a Lemony Snicket book], EDGAR. I needed all the crossings, but after the fact realized that author Daniel Handler was playing on EDGAR Allan Poe. This Wikipedia section reviews a bunch of literary allusions that Handler included in his book series. T.S. Eliot! Baudelaire! Multiple Poe references! Orwell, Salinger, Pynchon! Overall, the fill is smooth and theme is a new concept rather than a tired retread. 4.2 stars from me. Parse that as “P be J”. That is, change initial Ps (in theme answers only) to Js to wacky effect. 23a. [Female donkey that doesn’t want to work?] JENNY LOAFER (penny …). 25a. [What Heath Ledger wore in “The Dark Knight”?] JOKER FACE (poker …). 41a. [Irish dance with a Cuban twist?] JIG LATIN (Pig …). 43a. [Why one wears ballet shoes?] FOR JETE’S SAKE (… Pete’s …). Only one that features a pronunciation change born of the letter substitution. 64a. [Resentful Mrs. Biden?] BITTER JILL (… pill). 68a. [Useless porch chair?] JUNK ROCKER (punk …). 86a. [Where trash gets locked up?] GARBAGE JAILS (… pails). 89a. [Spot where morning moisture collects?] DEW JOINT (… point). 108a. [Command telling your butler to ready the plane?] JET, JEEVES (pet peeves). Only tandem conversion among the themers. Also entails introduction of punctuation. 111a. [Restraint used while telling jokes?] JEST CONTROL (pest …). 115a [Whale] ORCA. Weak clue, too vague. Orcinus orca refers to a species that is the largest member of the dolphin family. Dolphins and whales comprise the cetacean group, so one can indeed say that all dolphins, including ORCA, are whales. There’s speculation that ‘orca’ may ultimately derive from a Greek word possibly including some kind of whale, but that’s rather tenuous, no? So again: weak clue, too vague. 44d [Russian oblast] OREL. This one seems similarly loose. I’m no expert on Russian geography, but there are 46 Russian oblasts of which Oryel (variant spelling: OREL) is one. 6d [Musk of Tesla] ELON. Was this one of the ingredients in the Weird Sisters’ concoction? 11d [Cavs superstar, briefly] LBJ. 78d [Oppressive mother’s emotional tactic] GUILT TRIP. Dads do this too. Idea: make it gender-neutral “parent’s” or qualify it with a modifier like “stereotypically”. 58d [Studied secondarily] MINORED IN. Nice. Too bad it’s followed by 59d [Lower part in a piano duet] SECONDARO. Jeez. 68d [Early summers] JUNES. Faked me out; was sure it was ABACI. Similarly 43d [Like alley cats] FERAL woolled me into putting in STRAY. And 11d [Unlikely to mix]? ICY before SHY. Favorite clue: 31a [Walk together] TROOP, just ’cause it’s different. 62a [Kith’s go-with] KIN. Kith = friends, kin = family. 1a. 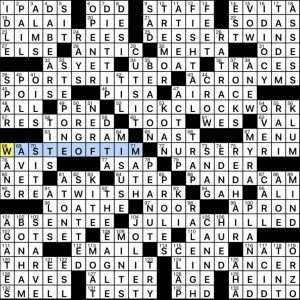 [With 22- and 126-Across, saying about the difficulty of dieting? ], A WAIST / IS A TERRIBLE THING / TO MIND. A mind is a terrible thing to waste. Awkward split of the answer, with the last two words at the bottom. 36a. [Proverb about creeps getting their just deserts? ], TIME WOUNDS ALL HEELS. Time heals all wounds. Have seen the “time wounds …” riff many times before. 69a. [Handles every objection? ], ANSWERS ALL THE NOES. Knows all the answers. “All the noes” is a terrible little formation. 96a. [Fed up with a corporate VIP? ], BORED OF THE CHAIRMAN. Chairman of the board. Not of a piece with the adages/phrases in 1a and 36a. 114a. [Spars during dance music? ], PUNCHES TO THE BEAT. Beats to the punch. These don’t feel consistent to me, but the theme is better than the fill. Far too much fusty old junk—HARI DAH TOG EROSE EARED OENO THAR AST MOA SNEE ESTE TARS ETO. 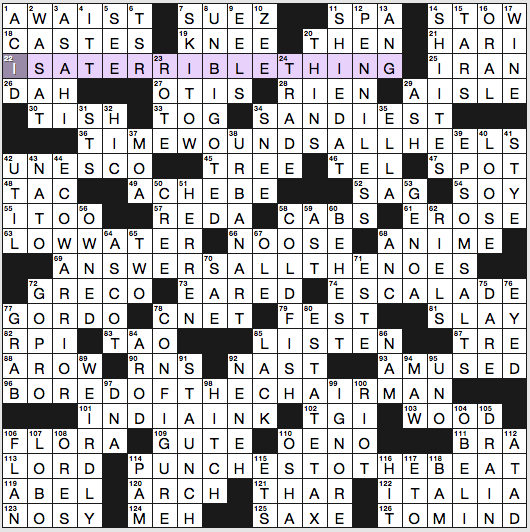 (When you drop “bygone” into more than one clue, you’ve got too much crosswordese.) The verb phrases SHIED AT and WAS AT are awkward. COLD FISH would be better without “fish” in the EELS clue. 80d. [Going rate? ], ESTATE TAX. Don’t forget that this is entirely irrelevant to a huge majority of Americans. If you leave your heirs less than $5.49 million, there’s no estate tax. This applies to only 0.2% of people. The other 99.8% receive no benefit from the GOP’s plan to repeal the estate tax. Overall, I was not 93a. [Tickled], AMUSED by this puzzle. 2.5 stars from me. In the NYT puzzle, I assumed CARVER referred to the person assigned the task of carving the turkey for Thanksgiving dinner. You might be new here. Sometimes, we make jokes. Oh man, it didn’t even register for me that “Mountain ash” (ROWAN) was an ash *tree*, I assumed it meant, like, volcanic ash or something. Yep, I assumed the same thing. I guess that makes it an extra-tricky clue. Today I learned that a mountain ash is not actually related to other ash trees…it just has similar leaves. So rowan is probably a better term to use, to avoid confusion. Re: the bonus FOUR, I think that four actually is the only number n that actually has n letters when spelled out, so it’s kinda special and that fact maybe inspired the whole puzzle. Can’t disagree that NLE and TARED are real woofers. I actually really like TARED! Shouldn’t really count as a hard one, since anyone who has ever bought anything from the bulk bins at the grocery store has had to TARE their container. The 4 thing is very clever then. Really liked this theme & execution. My only quibble with the fill is PEELE & PEELER. A little odd that EDGAR & NEVERMORE weren’t cross-referenced in some way but they may not have wanted to confuse the theme. Amy asks if anyone legitimately uses the term “NBAERS.” I assumed that it was common among the ALERS and NLERS who are only found in crosswords. Part and parcel, part and parcel. NYT was a very okay “here are things” puzzle. Congratulations for finding them. Next. WaPo was pretty funny. LIMB TREE was horrible. Sorry, Evan, but it’s going to take a while to get that one out of my imagination, but I think Merl might have roared out loud at GREAT WIT SHARK and THREE DOG NIT — at least, I did. Thanks. NYT. I immediately put in MILLS (Hayley) for 27A which gave me a bad start. I guess that’s what I get for being an older solver. Ditto. But I waited, and was OK for that one. I enjoyed the NYT theme more than Amy, including FOUR. The fill not so much. Lots of family-friendly names, no doubt, including two(!) different Star Wars clues and yet more scifi. But then also a lesson in Latin grammar I’m not so sure was warranted. One thing, though, no one’s mentioned: I think of Maya Lin was an architect and artist. Does her work on memorials really make her a designer?